What the hell is a relic? 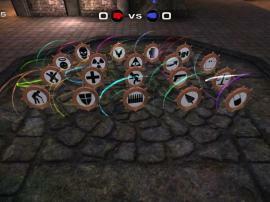 The relics are items that move around the map and give you special powers. You will be able to pick up only one of them. - Relic of Strength: Doubles the damage that you do. - Relic of Defense: Reduces all the damage you take by half. - Relic of Health: Regenerates your health. - Relic of Haste: Multiplies your speed by 1.5. - Relic of Redemption: Gives you a second chance at life. - Relic of Vengeance: Creates a big explosion after your death. - Relic of Adrenaline: Gradually increases your adrenaline counter up. - Relic of Agility: Provides you a powerful jump. - Relic of Ammo: Gradually increases your ammunition up. - Relic of Disability: Makes your target almost stop moving. - Relic of Guns: Makes you shoot faster. - Relic of Equilibrium: Distribute damage you take amongst nearby players. - Relic of Infancy: Decreases you in size. - Relic of Invisibility: Makes you invisible. - Relic of Momentum: The momentum of damage is increased. 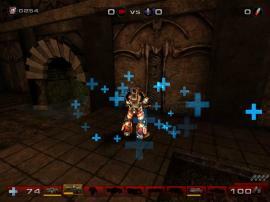 - Relic of Radiation: Gradually decreases the opponents' health near to you. - Relic of Translocation: Your location is exchanged with your victim's location. - Relic of Vampire: Grants you the ability to drain opponent's life damage. - Evil Relic: Gives you a rare illness. - Mutant Relic: You become a Mutant (Mutant Gametype). 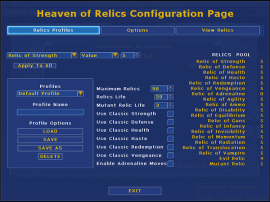 You can choose the amount of relics of each type to place into the scenario, hide the relics' symbols, allow to toss the relic you carry, use the classic relics, and other features. Upload authorization pending. Posted screenshots and modified the mod profile. It will be released this week. 6 new relics! New options and bug fixes included in this file. Heaven of Relics Beta 3, with rewards, the Evil Relic and more features. Heaven of Relics Beta 2, with network games support. Have fun! This mod is a lot of fun it adds a nice twist to the game. This is something that should have come with the game already. Its a must have. I'm glad you made this mod, thank you! How do you make it so you can pick up 3 Relics at a time? Not sure if it was this Relics mod for 2004 or 99. I remember picking up more then one Relic somewhere but not sure what game it was in. Heaven of Relics is only available for UT2004 and doesn't let you carry 3 relics at a time. I think you played UT2004 with a relics mutator, but it wasn't this one. Is this similar to the original UT1999 Relics mod?Also why aren't the relics in 3d like with the original relics mod for UT1999?The rotating 3D skull for the relic of vengance is so cool,etc...! Yes, it's similar to the UT99 classic mutator. One of the best (my opnion; this is the best) UT2004 mods. It's creative, fun and large.